Garden Route Jam Jar Adventure. Any fun plans for the weekend or Mothering Sunday? Nothing much planned here as my Husband is working and my older Sons both live far away. Garden Route Jam Jar Adventure anyone? 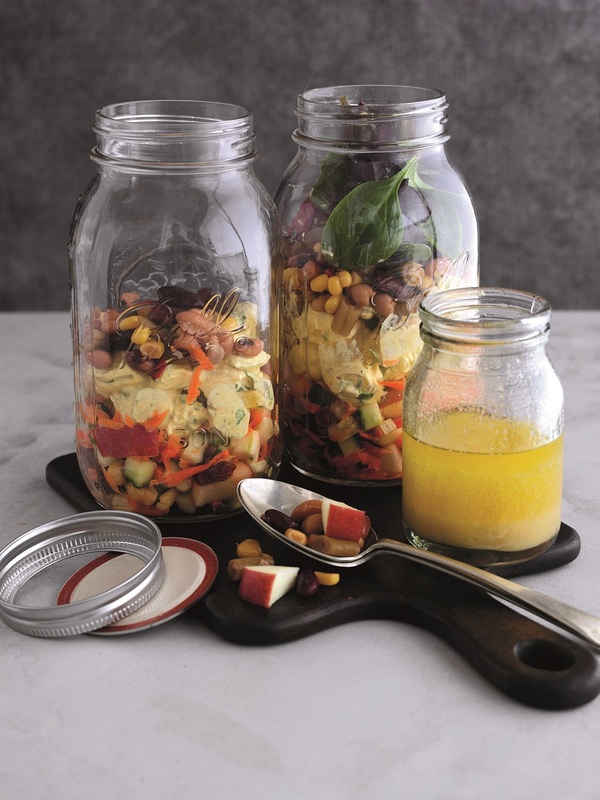 These layered salads are made in Kilner jars or screw-topped jam jars, with dinky little side jars of extra dressing. They’re perfect for a healthy packed lunch – and brilliant for picnics too! 1 Mix together the apple, lemon juice, carrot, cucumber, raisins or sultanas and peanuts. Share between 4 Kilner jars or large screw-topped jars. 2 Combine the chicken, pear, yogurt, turmeric, cumin and coriander or parsley. Season. Spoon into the jars and top with the mixed beans and salad leaves. Seal with the lids and keep cool. 3 For the dressing, mix together the olive oil, lemon juice, mustard and honey with a little salt and pepper. Pour into small jars. Use to dress the salads just before serving. Cook’s Tip: For a vegetarian version use feta cheese instead of chicken. What do you think of this Garden Route Jam Jar Adventure recipe? How To Make A Nice And Healthy Feta and Grilled Peach Salad With Toasted Seeds. Crayfish, Avocado And Watercress Salad With Cucumber And Lime Butter. Superfood Strawberry and Pine Nut Salad. How To Make An Italian Orzo Pasta Mason Jar Salad. "Time To Move On: Welcome To The Weekend Link Up"
"Free State Chocolate Pear Pudding"
What a great lunch! Easy to bring to work – Thanks for sharing at the What's for Dinner party.